I had spent the night on the California side of Titus Canyon in Death Valley. One can drive 2.6mi from the pavement to the trailhead for Titus and Falls Canyons. Vehicle traffic in Titus Canyon is one-way, from Nevada to California, and the mouth of the canyon is signed as such. 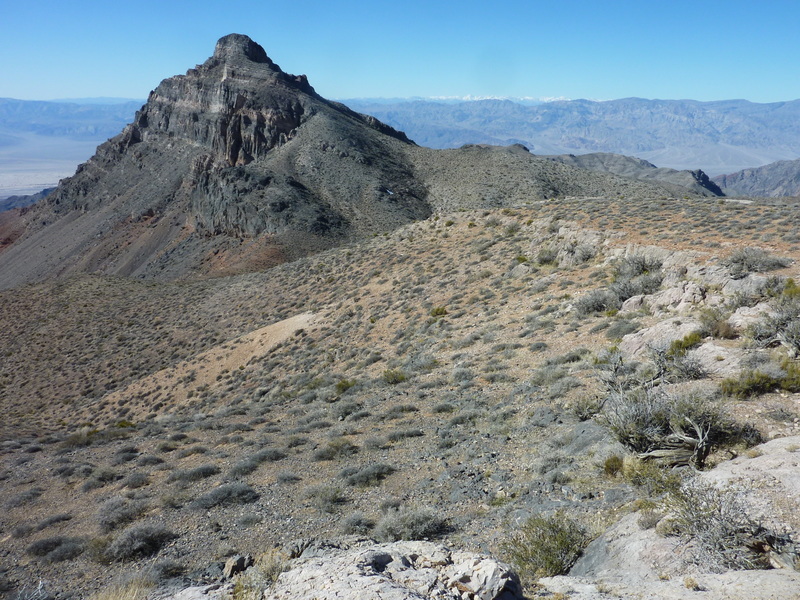 Thimble Peak, a P1K, is located about a mile and a half off Red Pass, the highpoint of the Titus Canyon Rd. It is a pretty easy hike with a high clearance vehicle and is fairly popular. There was no way my van could drive in Titus Canyon so I would have to hoof the 10 miles to Red Pass on foot. I held out hope that I could thumb a ride on the way back but that was not to be. There were no vehicles whatsoever all day even though the California side up to Red Pass was in good shape. I suspect a washout somewhere on the Nevada side has temporarily closed the road from that end. The outing, done the hard way, would come in at almost 25mi and nearly 7,000ft of gain. Still, way easier than yesterday's Descent of Doom down Happy Canyon. Mine was the only vehicle camping at the TH, leaving the place to myself when I arose at 6a. I dressed, breakfasted and was on my way up the road half an hour later. The most interesting part of the canyon is the initial two miles where the bottom is narrowest and the walls tower hundreds of feet overhead. The hiking was easy on the gravel roadway with a modest gradient - it rises 4,400ft to Red Pass in just over 11mi. Near the 5mi mark is an NPS sign at the site of some petroglyphs. The rock to the left of the sign had a number of such etchings while other rocks on either side of this (and some on the main rock) had more modern scrawls by characters who thought it a fine opportunity to leave their own marks. These were not the brightest ones to drive and hike in the canyon. For most of the first hours there was no sunlight penetrating the bottom of the canyon, thanks to the high walls on the south side. By 9a I had reached the upper valley where the road turns southeast and the place was flooded with sunlight. A boom town fed on highly exaggerated claims brought 300 people here in 1926-27. Leadfield was a flash in the pan, leaving worthless mine shafts and a few abandoned buildings when the post office closed in early 1928 to mark the town's death. I reached Red Pass at 5,300ft just after 10a. I was happy to find a good use trail leading from the pass to the summit of Thimble Peak in 1.6mi. As a bonus, it goes over the top of nearby Thimbles Shadow, a name bestowed by Courtney Purcell in his guidebook, Rambles & Scrambles. Without the trail, Thimble's final 100ft to the summit might go as class 3. There are a few easy scrambling moves on solid limestone just before the top. As one might expect from a P1K, the views are quite expansive, particularly looking south down the length of Death Valley to Furnace Creek and beyond. The DPS Corkscrew Peak is prominent in the same direction just beyond Titanothere Canyon that separates it from Thimble Peak. The snowy Sierra can be seen far to the west beyond the Cottonwood and Inyo Mountain ranges. The higher, colorful summits of the Grapevine Mtns are displayed to the north, with Beatty and the Amargosa Desert to the east. A register only a year old was already filled with entries, all from 2016. Not recognizing a single name, I didn't bother to photograph the pages as I usually do. To add a little adventure to the outing, I decided to follow a shallow canyon heading north from Thimble Peak that empties out at Leadfield in about 2mi. I thought it might save some time since it cut off about a mile and half of the trail/road via Red Pass, but that didn't really pan out. The hiking in the sand/gravel bottom started off easily enough, but it narrowed in a few places requiring some class 3 scrambling (fun), eventually dropping in a cliff just before Leadfield, with the valley and road hundreds of feet below the top of the cliff. I climbed left out of the canyon to an adjacent one before finding a way down. There were more mine shafts and old ruins here among the cliffs where I found vestiges of old mining trails and large rock cairns built 90yrs ago by those that occupied the higher ground here. It was all great fun really, and I enjoyed the additional history lesson I would have otherwise missed. I met back up with the Titus Canyon road at a sharp bend where the NPS has placed a sign warning folks to avoid the many pitfalls of examining old mining sites. I put away my gloves and set a strong pace to descend the remaining 9mi back down the canyon. Six miles from the end I came across an older couple hiking in the canyon, heading up to visit Leadfield. They were in fine spirits even if going at a more measured pace, and to answer their question I told them they still had 2.5mi to go. "Was it worth it?" they asked. I didn't want to deflate their interest, but as old mining sites go this one isn't all that worth it, at least what you can see from the road. Instead I simply responded, "It's a really nice hike." The sun was shining brightly in much of the canyon now and it was getting warmer the further I descended (it would be 80F back at the TH). The only other person I saw during the hike was a solo middle-aged woman in the last half mile. She looked rather disheveled, carried a thick, crooked piece of wood for a walking stick and her bare legs looked like they were half-covered in dried mud. She smiled when I greeted her, only commenting, "It's much cooler here in the canyon." I love Death Valley. Falls Canyon definitely worth a visit. As with a lot of the area's slot/box canyons there is a dry fall that requires a move up and to the right to circumvent. A canyon wren serenaded us that April day when we were there. Thimble Peak a great spot to be on Valentine's Day !